Joint dislocations are common, and the shoulder is half of all joint dislocations. In the emergency department, we traditionally confirm the diagnosis on xray, reduce the shoulder (interscalene block anyone? ), and then confirm reduction on post reduction xray films. The usual downsides of xray compared to ultrasound apply here - more time, more radiation, and having only a static image. 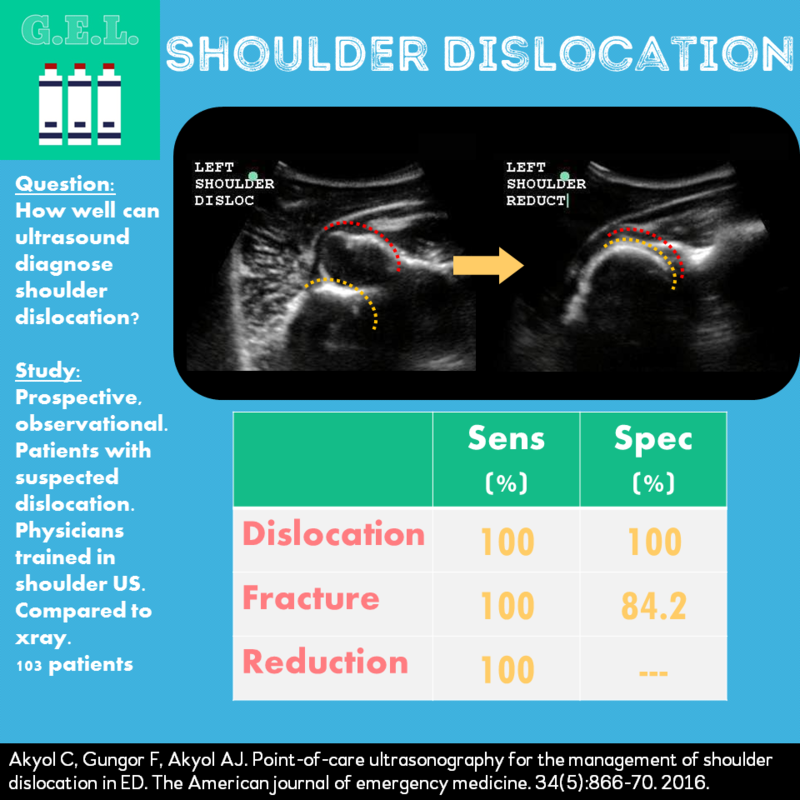 Ultrasound potentially offers a way to diagnose shoulder dislocation, but how well does it perform in doing so? How does POCUS compare with xray in diagnosing shoulder xray? How does POCUS compare with xray in diagnosing fractures and verifying reduction? 2 hours of practicing including diagnosing fracture in greater and lesser tubercles, humeral head, humeral neck, and glenoid rim. Also identifying hill sachs and bankart fractures. Study patients received POCUS of the shoulder prior to xray and then again after reduction attempt. Probe choice: In this study a high frequency linear probe was used. You can also use a curvilinear probe. Step 1: view shaft of humerus in short axis, posteriorly. In this study, sonologists could not accurately determine anterior versus posterior dislocation. 1. Ultrasound can be used to diagnose shoulder dislocation and reduction. In this study 100% sensitive and specific. 2. With training, ultrasound can also recognize shoulder fractures with high sensitivity.